This week we’re pleased to cast the spotlight on AskYourUsers.com — an online, “micro-consulting” platform that links experts with businesses that wish to temporarily utilize their services. AskYourUsers.com is a marketplace that connects businesses seeking feedback with LinkedIn members who are available for hire as anonymous, temporary micro-consultants. The platform uses LinkedIn as its primary means to match businesses with relevant consultants. Consulting gigs are limited to 15 minutes in duration, which makes it a convenient and affordable solution for experts and businesses alike. On the AskYourUsers website, individuals can easily sign up as paid micro-consultants through a one-click login with LinkedIn. As a consultant, you’ll be prompted for your required hourly rate, as well as a PayPal account where payments for your consulting services can be deposited. 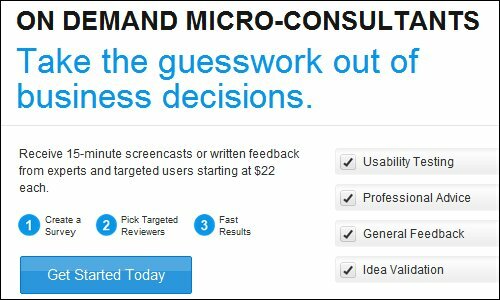 Similarly, if you’re a business, you can create tasks for micro-consultants by clicking the “Get Started Today” button on the AskYourUsers homepage. You’ll be prompted to provide a Task Summary, along with a number of specific tasks or questions you’d like your consultants to address. You can also specify the demographic information you require for your consultants; this data will be cross referenced against consultants’ LinkedIn Profiles to make sure you only receive responses from qualified individuals. 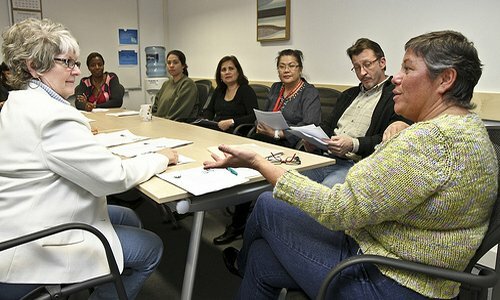 AskYourUsers says that you can “expect to receive results as early as 5 days from your job posting,” and that “depending on the demographic requirements, your completed job may take up to 14 days.” Micro-consultants’ responses are audited for quality and completeness by AskYourUsers staff. AskYourUsers co-founders, Amelia Dunne and Chris Bumgardner, have an extensive background in the startup community. As they developed ideas for their respective startups’ products and services, they discovered that prototypes and concepts often needed to be vetted before moving on to the next phase of development. The typical startup doesn’t have a large market research budget. Even if it did, time is another resource it can’t afford to waste trying to procure qualified candidates to provide actionable feedback. Thus, the concept of AskYourUsers was born. According to Dunne, AskYourUsers is the “easiest, most affordable way for businesses to engage targeted professionals for quick expertise and feedback requests.” Given that micro-consulting assignments are a maximum of 15 minutes, this “eliminates the time and cost of recruiting, vetting, negotiating, engaging and hiring expensive experts,” she adds. Because the primary means of matching a business with a consultant is through his or her LinkedIn account, “businesses can find the exact professionals they need,” according to Dunne. Since micro-consultants remain anonymous, “this leads to honest, objective feedback and makes it easy for professionals of any type to share professional knowledge and expertise,” says Dunne. If you need timely feedback on an idea, market research, or simply professional opinions on whatever project you’re working on, then AskYourUsers.com is an easy, affordable way to obtain this input. Without having to break the bank or spend hours (or days) trying to organize a relevant focus group, simply post your task to AskYourUsers, specify your criteria and demographic requirements — and your focus group will come to you! On the other hand, if you are a subject matter expert you can parlay your expertise into cash — at a rate that’s competitive with standard consultancy compensation. You’ll not only expand the market for your professional services, you’ll be providing valuable feedback to organizations that you might not otherwise have had the opportunity to consult with. Contact AskYourUsers through its website, on Twitter, or on Facebook.